When building or buying a home, you want it to be able to withstand harsh weather conditions to protect yourself and your family. 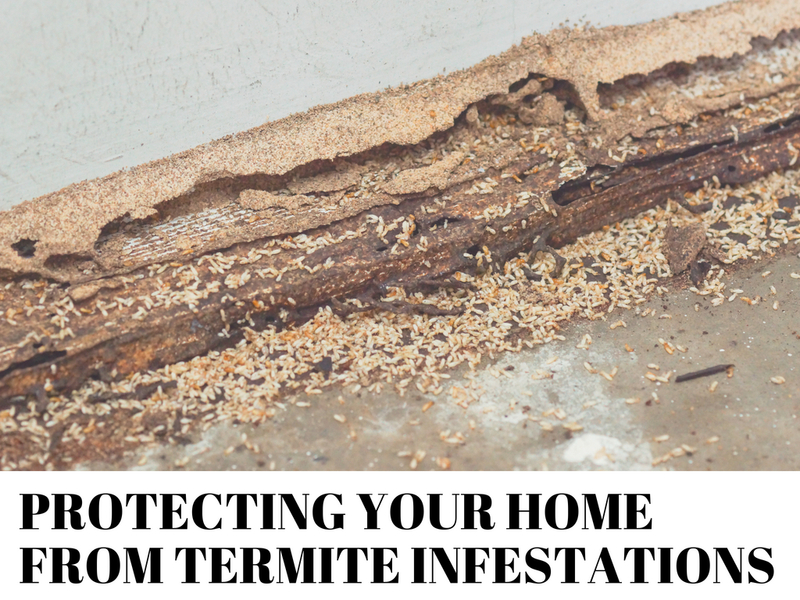 However, you may not realise that your home can also be destroyed from the inside without you knowing it – courtesy of the sneaky termites living in your residence! In NSW, there are 300 species of termite. Of these, the subterranean termites cause the most damage. These pests live in colonies underground, probably directly under or around the perimeter of your home. They can eat through different materials undetected, compromising the foundation of your home and damaging your properties. Cliché as it may sound, but prevention is always better than cure. And this could not be more true than when it comes to termite infestations. Here are some ways that you can prevent termites from taking over your precious home. Termites need moisture and food in order to survive. Therefore, the first and second steps to prevent termite infestation in your home are to cut off their food supply and to minimise the moisture inside and around your home. Regularly inspect your home for any holes and damaged vents, plumbing, downspouts, roof, walls and other areas where water leak may occur. Have them repaired or replaced as soon as possible. Keep plants, trees, and garden beds away from the sides of your home. They may increase your home’s curb appeal, but they make the best places for termites to live in. Make sure that your subfloor spaces and areas around your house are free of junk and debris, especially unused timber, boxes, tree cuttings, and other garden supplies. These items could attract termites and could make perfect breeding grounds. Have your property thoroughly inspected by your local pest control expert at least once a year. Prevention is only half the battle against termites. There are ways to ensure that your home is well protected from these pests. Here are some of them. Metal shields. These metal barriers can be placed along walls to stop termites from entering through joists and bearers. Concrete stone barriers. These can be installed around or under concrete slabs or suspended floors. Fine granite chips. Granite chips with sizes ranging from 1.7-2.4 mm, which can’t be carried or moved by termites, can be installed under your home. These would prevent termites from passing through the spaces as well. Fine stainless steel mesh. By putting continuous sheets of fine steel mesh in your external walls, plumbing and under concrete slabs, termites will not be able to enter your home. Termite resistant materials. Incorporate naturally resistant timber, steel, and masonry into the different elements in your home. They may not prevent termite entry for the whole house, but they could minimise damages. APVMA-approved chemicals. Chlorpyrifos and Bifenthrin are used to treat layers of soil around and under the home. Together with the concrete slab, they form an integrated barrier that hinders termite access to your home. Treated timbers. Treating timbers that will be used in constructing your home and fences with certain chemicals is an effective way to protect your home from termite invasion. Handling chemicals and installing physical barriers may pose certain risks to you, your family and your property, so it is highly advisable that you contact someone well-trained and knowledgeable Let Local Pest Control do the work for you. Contact our local pest control experts today! I HATE RODENTS! WHAT SHOULD I DO?